Keith Erekson, the library’s director, provides an overview of the Church History Library: who we are, what we do, and what kinds of records we preserve and make available to the world. Simply put, the Church History Library is home to all of the archival, manuscript, and print collections of The Church of Jesus Christ of Latter-day Saints. Keeping meticulous records has been a staple of the Church since the 1830s. On the day the Church was organized, Joseph Smith received a revelation in which the Lord instructed, “Behold, there shall be a record kept among you” (D&C 21:1). Today the Church’s records are kept in the library and are an important part of carrying out the work of the Church. Many of the records are also available to external researchers, including students, scholars, genealogists, and journalists. How Is the Church History Library Different from a Public Library? The Church History Library is part corporate archive, part special collections, and part research library. Unlike a public library, which loans items to patrons, the Church History Library makes records available online and in a secure reading room. We invite anyone interested in exploring Church history to visit the library online or in person to study our collections, draw conclusions, and make responsible interpretations. What Records Will I Find at the Church History Library? 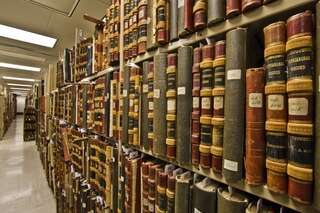 The Church History Library holds the world’s largest collection of materials by and about the Church and its members. The holdings span the Church’s chronological history from the 1820s to yesterday; its geographical expansion from New York to the world; its ethnic and linguistic variety, including items in more than 150 languages; and its organizational structure, from Salt Lake City headquarters to the smallest local Church unit. These records tell the story of the Restoration through institutional development and personal experiences, including those of Church Presidents, members, missionaries, pioneers, congregations, auxiliary organizations, temples, family history, worldwide Church growth, and service. Can I Visit the Church History Library in Person? Yes! Visitors come to the Church History Library to research topics related to the Church and its history, do family history research, or participate in programs and events. hosted in the library. Visitors to the library can also view original documents on public display. The Foundations of Faith exhibit displays some of our most priceless treasures, including a page from the original manuscript of the Book of Mormon; the extremely rare Book of Commandments; Joseph Smith’s letter from Liberty Jail, excerpts from which were later canonized as Doctrine and Covenants 121, 122, and 123; personal journals of early Church leaders; and founding records of Church auxiliary organizations and activities. In the library, you can browse reference materials in the open stacks, but most of the library’s materials are preserved in climate-controlled storage and can be called to a secure reading room for viewing. In preparation to access physical materials, patrons watch a brief orientation video and register using an LDS Account. Once registered, patrons are able to request items from the secure stacks, save online searches, and access additional digital assets in the online catalog. Registration can also be completed online before arriving at the library. You can plan a visit to the library here. Do you have a question for a Church historian or conservator? Ask us here.